Below is a list questions our patients frequently ask about their vision. If you need a specific question answered we invite you to e-mail “Dr. See” or call Tempe Eye Care Associates: 480-967-4910. Q- How often should I get an eye examination? When should I schedule my child’s first eye examination? A- As a parent, you may wonder whether your preschooler has a vision problem or when you should schedule your child’s first eye exam. Your family doctor or pediatrician likely will be the first medical professional to examine your child’s eyes. If eye problems are suspected during routine physical examinations, a referral might be made to an eye doctor for further evaluation. 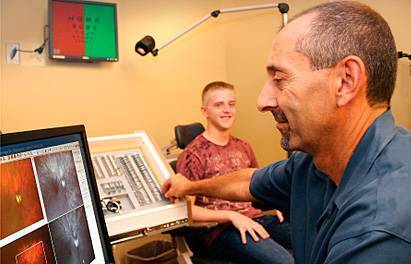 Eye doctors have specific equipment and training to assist them with spotting potential vision problems. Eye exams for children are extremely important, because 5 to 10 percent of preschoolers and 25 percent of school-aged children have vision problems. Early identification of a child’s vision problem can be crucial because children often are more responsive to treatment when problems are diagnosed early. Children’s vision care is essential to every child’s development. Experts say that over 80 percent of what a child learns in school is presented visually, so making sure your son or daughter has good vision can make a big difference in their academic performance. Q- Do I have to be dilated? A- All new patients under 18 years of age will be dilated during their examination or have the dilation rescheduled at a convenient time. It is most important to relax the internal muscles of the eye during their vision assessment. Dilation after the first examination is at the doctors’ discretion based on condition, age, symptoms, etc. Adult new patients will have the option of obtaining images with the OptoMap retinal examination. Or they can choose dilation. The OptoMap provides a digital image of the retina and optic nerve. Many times, the OptoMap can be done in place of a dilated fundus examination. If the images are not satisfactory or other conditions exist that warrant dilation, the doctor will inform you of the need for further testing. As with children, if dilation can not be performed on the day of the examination, it can be rescheduled at a convenient time. Q- Can I drive while I’m dilated? Q- Do you have a large selection of frames? Q- What about Refractive Surgery? Q- What About LASIK surgery? A- “We have a list of experienced and competent providers to which we refer patients in need of any secondary, tertiary or cosmetic care. The list is inclusive of specialists in LASIK, cataracts, glaucoma, retina, oculoplastics and any other ophthalmic or medical specialty. Q- Are there other options for my vision correction? A- “Exciting technological advances are being made all the time in the field of vision correction, including Implantable Contact Lenes “ICL”, Intraocular Lenses “IOL” and Orthokeratology. Implantable Contact Lenses “ICL” allows correction of a wider range of refractive errors with greater predictability than LASIK. Another advantage is that use of the ICL requires NO laser ablation of corneal tissue. Cataract surgery and clear lensectomy are options that replace the natural lens of the eye in order to restore clear vision. Intraocular Lenses “IOL” are implanted in the eye in order to correct vision. IOL’s are now being made with multifocal optics which would allow patients to see both far away and at near. We can provide an independent resource for refractive surgery information, free consultations and preoperative evaluations to help determine candidacy and suitability, referrals to a surgeon selected specifically for you, and post-operative care, all in a convenient, local location. Q- Do you accept my insurance? Is vision-optical insurance available? A- “We are members of various insurance plans. It is always best to call the office to determine if we are on your particular panel. Most plans do not require anything other than an ID number in order to check authorizations, etc. Once your plan is identified, our staff is able to explain the medical and optical benefits provided. Q- I use a computer all day. Is that hurting my eyes? A- “Computer vision syndrome (CVS) is a very real problem for many people who spend hours daily in front of a computer screen. Sometimes, simply rearranging your work environment to create better ergonomics is all you need to do in order to reduce eye strain and other vision problems related to CVS. In some cases, a pair of computer eyeglasses may help you see better at just the right distance range needed for viewing a computer. Words on a computer screen are created by combinations of tiny points of light (pixels), which are brightest at the center and diminish in intensity toward their edges. This makes it more difficult for our eyes to maintain focus on these images. Instead, our eyes want to drift to a reduced level of focusing to reduce fatigue. Our eyes do this involuntarily, and then strain to regain focus on the screen. This continuous flexing of the eyes’ focusing muscles creates the fatigue and eye strain that commonly occur during and after computer use. Q- Are there vitamins/supplements I can take for my eyes? A- “Research suggests that antioxidants and other important nutrients may reduce your risk of cataracts and macular degeneration. Antioxidants can have additional benefits as well; for example, vitamin A protects against blindness, and vitamin C may play a role in preventing or alleviating glaucoma. Omega-3 essential fatty acids appear to help the eye in a variety of ways, from alleviating symptoms of dry eye syndrome to guarding against retinal damage. If you have any further questions, e-mail “Dr. See” or call our offices at 480-967-4910. Our staff will be more than happy to assist you.